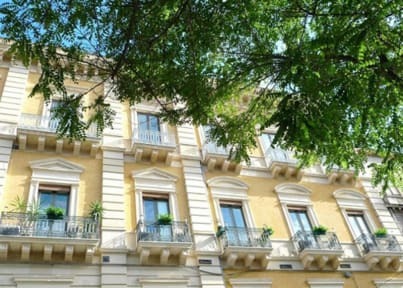 Catania, 이탈리아의 5 발코니 B&B | 호스텔월드에서 예약하세요. We are situated in the historic heart of Catania, right above the 13th century Ursino Castle, which dominates the piazza and gardens of Federico di Svevia. Here you can wine and dine 'al fresco' on delicious typical dishes at very reasonable prices, while soaking up the atmosphere of a real Sicilian quarter. We offer elegant and luxurious rooms: a single, doubles (1 with an extra single bed) and a twin. The twin and double w/extra bed also interconnect for a family of up to 5 people. 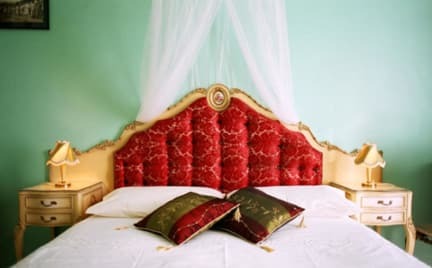 All have 5 metre high domed ceilings and chandeliers, very comfortable beds with mosquito nets, duvets in winter and flowering balconies of iron and marble. NB: Air conditioning/heating, free Wi-Fi are standard in all the rooms. Tea/coffee making facilities, a fridge, DVD and video player are also available for guests use. Our breakfasts are nutritious and delicious and can be taken in your room or in the communal dining area. Tea (Indian, herbal, green. mint etc) ~ coffee (espresso, macchiato or cappuccino) ~ Hot Chocolate. We are only 10 min. from the airport, a 15 min. walk to a long, golden sandy beach and a convenient base for exploring the Eastern side of the island. (Taormina, Etna, Enna, Pantalica and Siracusa are all within a 45 minute drive). The greatest hospitality that i served here was the most memorable thing in my catania travel. Although we checked in late, he explained everything nicely. Because of early morning plan we had to skip the breakfast but he prepared some food for us in the morning. He kept our luggage after checking out time and let us stay in living room after check out time because it rained outside. He is the best host that i've ever met.